Kerala - a state known for its beauty, from its beaches and backwaters to ancient ports, palaces and the hospitality of its people has taken a severe blow from Mother Nature and needs all the help it possibly can get to get back on its feet. Having received unusually high amount of rainfall this monsoon season, Kerala has faced the worst flooding in nearly a century. And though the flood waters are receding, repairs to the state, from the micro grass-root level of an individual's home to the state- run infrastructure is going to be a slow, long and very tedious process that will require tones of funds. People all over the world are trying to help those affected, in whatever way they can. And without having to get into the actual projected figures, suffice it to say that any and every bit of additional aid pouring in - whether in the form of currency, basic necessities, foods, goods, furniture hardware or services - is more than welcome. What has been amazing to see are the collaborative efforts put together so far from all spheres - political, local population, armed forces, NGOs, national and international donors and more! 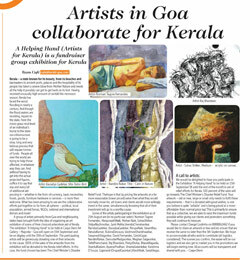 A group of artists primarily from Goa and neighboring states have brought forth the idea of organizing an art exhibition of some of their choicest artworks in aid of Kerala. The exhibition "A Helping Hand" to be held at Carpe Diem Art Gallery - Majorda - Goa will open on 15th September and be on display until the 30th of September. The participating artists will be generously donating one of their artworks to the cause. 100% of the sales of the artworks from the exhibition will be donated to the Kerala relief efforts. In this case, the fund chosen has been The Chief Minister's Disaster Relief Fund. The hope is that by pricing the artworks at a far more reasonable (lower priced) value than what they would normally move for, art lovers and clients would more willingly invest in the same, simultaneously knowing that all of their investment will go to a worthy cause. Some of the artists participating in the exhibition as of 25th August are (in no particular order): Norman Tagore Fernandes, Manjunaath Naik, Mohan Naik, Suhas Shilker, Shilpa Nachinolkar, Jyoti Mehta, Veenita Chendvankar, Ramdas Gadekar, Kausalya Gadekar, Nirupa Naik, Vasant Rao, Vatsala Kamat, Rubina Desouza, Vaishnavi Shankhwalkar, Swapnesh Vaigankar, David Fernandes, Girish Gujar, Nandini Raikar, Damodar Madgaonkar, Meghan Salgaonkar, Tathi Premchand, Raj Bhandare, Pietyz Dsilva, Bharati Kapadia, Shardul Kadam, Aparna Pradhan, Shweta Satardekar, Karishma D'Souza, Gajanand (Drupad Gaonkar),Vitesh Naik, Savia Viegas. We would be delighted to have you participate in the Exhibition "A Helping Hand" to be held on 15th September '18 until the end of the month in aid of relief efforts for Kerala. 100 percent of the sales will go towards The Chief Minister's Disaster Relief Fund. Your artwork - old or new, large or small only needs to fulfil these requirements - that it is donated with good wishes, is one you believe is quite "sellable" and is being priced at a more- affordable-than-normal price tag! This is primarily to ensure that as a collective, we are able to raise the maximum funds possible while giving our clients and promoters something they will continue to treasure.